This is not a new nail polish but it is new to me so I figured I had to show it to you before it was completely sold out. It was released as part of a limited edition mini nail polish collection for the 2010 Holidays and can still be found in a few beauty retailers drawers if you know what to look for; that's exactly what happened to a friend of mine last week and after she had told be about her precious find, I managed to get one myself the next day. 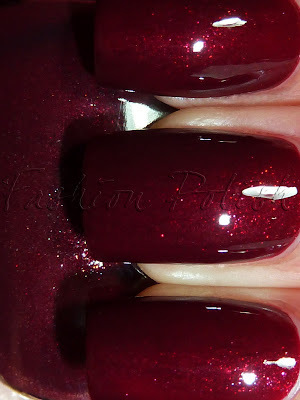 Le Rouge L’Wren Scott is a beautiful vampy burgundy jelly packed with tons of microglitters : gold, red, blue and purple. I had no issues whatsoever with application, 2 coats of a nice glossy finish. Depending on the lighting, it will appear either deep red or truly vampy but the intense shimmer will always give life to it. In conclusion I'd say that I'm really happy with this purchase, my first Lancome nail polish experience is definitely positive, especially with such a beautiful burgundy shimmer. 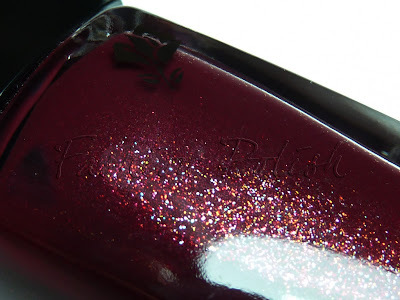 I don't know about you but Spring or not Spring, I'm always up for a vampy jelly! When I saw how tiny the bottle was, I couldn't make myself get it no matter how much I love this colour. ****LE SIGH**** Gorgeous, gorgeous. 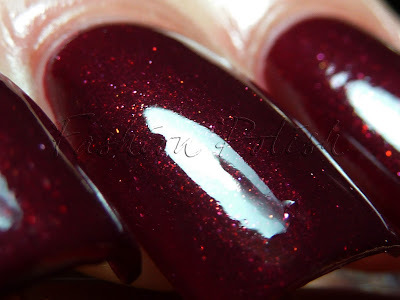 I've been hunting down this polish for a long time and finally found it and it hands down gorgeous! I mean the color and the shimmer are amazing! Also I have to blame you for making me buying Dior Purple Mix and Underground because your swatches were amazing! I think we have the same taste in polish! It would be fun to swap someday! It's a gem allright, I think the color is quit intense, in sunlight it has an almost ruby gemstone sparkle, and in lower lightings it turns into a very vivid vampy dark burgundy. I'm glad you enjoy it as much as I do. It is true that the size may be a dissapointment for some people, I know it was for me, the very first time I bought a Lancome mini ('Bloody Black Cherry, yes another Vampy LOL) at first I thought it was a tester, but the SA told me that was the 'new and improved' size. I suppose for the european market some brands have decided to size down the bottles of teir polishes, unfortunately.